For more than five years, Janney’s Uniontown, PA branch office has organized a team of 20 to 30 riders (made up of Janney employees, clients, friends, and supporters) for local Bike MS 150 rides, an annual 150-mile bike ride benefiting the National Multiple Sclerosis Society. 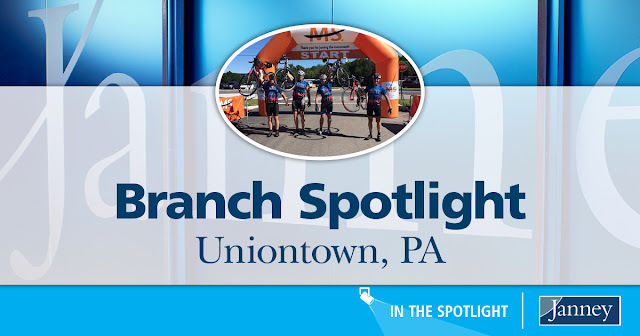 The Uniontown branch, led by team captain and Branch Office Manager John Coleman, aims to raise at least $10,000 through their annual participation. Every year they have exceeded this ambitious goal by raising $12,000 to $15,000 to fund critical services and MS research. Bike MS is a national two-day fundraising bike ride organized by the National MS Society, and the largest organized cycling series in the country. Through awareness and fundraising, the event drives breakthroughs in MS research and helps families affected by MS overcome the daily challenges of this unpredictable and lifelong disease. The event has become an annual tradition for employees of Janney’s Uniontown branch. Each year, the office will alternate between two rides in the surrounding region – the “Keystone Country Ride” from Hollidaysburg to State College and the “Escape to the Lake” route from Allegheny College to Lake Erie. The 2018 Bike MS: Glimcher Keystone Country Ride, held in July, will be the sixth time that Team Janney in Uniontown will participate in a local Bike MS ride. The cause is particularly personal for team captain John Coleman and fellow Bike MS rider Sharon Ruhe, a Senior Registered Private Client Associate in the Uniontown branch office. Both John and Sharon have close family members that suffer from MS. They see the annual ride as a mission to accomplish for their loved ones – John for his wife, and Sharon for her sister. “I believe if you are touched by this disease in anyway, you feel so helpless that you want to do something. The bike ride is the best way. I have also done the MS Walk in Pittsburgh quite a few times pushing my sister’s wheelchair. There is nothing like crossing the finish line with everyone cheering you on. The camaraderie is awesome,” said Sharon. John has a long history with Bike MS. He completed his first MS 150 ride in 1991 in Gettysburg, PA and has since participated annually in MS rides across the country, from Pennsylvania to California. Overall, John estimates that he has completed 20 Bike MS rides and raised over $100,000 for MS research. “The bike rides are a great way to get together our branch, clients, and friends to raise awareness about MS. It’s fun for everyone, not just the people who ride, but for everyone who is there cheering us on,” said John. For Janney, Bike MS is two-days of camaraderie and team building to help bring awareness to a worthy cause. The event also serves as an opportunity to encourage health and wellness activities in the branch, not only during the ride, but also through preparation and physical training. Weekly emails are sent to members of Team Janney in Uniontown in the weeks leading up to the event, scheduling rides two times a week, four to five weeks ahead of their ride.